My roommate is out of town for a few days and she left me in charge of watering the plants. She has a pretty solid collection of plants, but she wrote me down detailed instructions for how to take care of each one. She spelled it out for me. The plants in the mason jars on the window just needs a little bit of water. The Jerusalem Cherry gets a complete soil soaking. the avocado trees need to be fully soaked and drained in the sink. The elephant ear plant needs a full bottle of water poured all around the dirt. And the air plants need to be soaked in a bowl full of water, but only for an hour. She told me to do the air plants first because they were the most important. I’m not much of a botanist, i will admit that I had no idea what air plants are. I found all the other plants okay, but no air plants. I had to text my sister to ask what they were. She said they didn’t need soil and that people usually hang them from the ceiling or put them in teapots. I searched the entire apartment searching for something that matched that description. All I found were a couple of things like looked like cactus tumble weeds in glass containers on a bookshelf. I texted my sister back and said I didn’t see anything hanging from anywhere. She told me to take a video of the apartment and she would try to spot them. I made a quick video tour and went it to her. I also summoned up the courage to text my roommate and ask her what air plants are. I received responses from them both at the same time. The air plants were those little fuckers that I thought were cactus in the glass containers on the bookshelf. Mind blown. I was amazed, flabbergasted, and stunned. I never knew that air plants were even a thing before today. 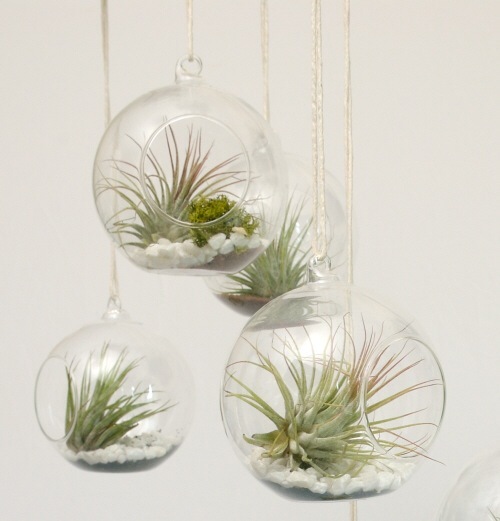 It makes me wonder how many times I walked past air plants before thinking that they were cacti. You learn something new everyday. Today I learned about air plants.